This week's theme at Illustration Friday is "Fail". 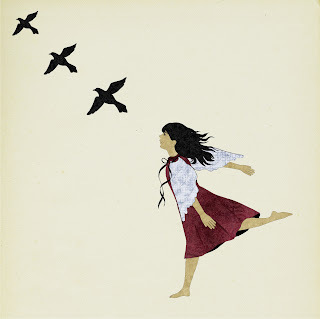 I decided to draw a little girl trying but failing to fly with the birds. Oh! Her hair and mind is a flying! Another failing situation turned to a winning one! This is really beautiful and gentle! Love your choice of colors. oh just a wonderful interpretation!! Ursula, This is so beautiful. I really think that you could make a whole picture book out of these images with the girl. (I am thinking a wordless picture book) They have that powerful yet quiet feeling to them. Yes, her heart is flying with the birds. Lovely illo, beautiful colors and textures. Beautiful!! Just love it! So much motion! So many people have said it - it's simply beautiful! What a great idea for the theme. Your work is always so graceful! Your illustration is so elegant and flowing. The feeling is so tender. Lovely! Love the simplicity and elegance of this. Also really like that you decided not to fill the background with landscape. To me, it implies, that she is flying in her imagination. Nice work! I look at this and I find myself imagining myself to be this girl. She is so light of foot and hopeful. She may not fly, but I know that her heart is soaring. I love the melancholy of this illo! Beautiful. Beautiful work. I am very happy I found your blog. love the movement in your work! Hello Ursula, I'm taking Paulette's "Backgrounds" class with you and stopped by to visit your blog. Beautiful work...particularly love your "Fail" and "Saved" pieces. I'll definitely stop back!